With this article we close the chapter on voicings within the framework of cadences by seeing how you can add tones to the cadence chords in the previous articles. 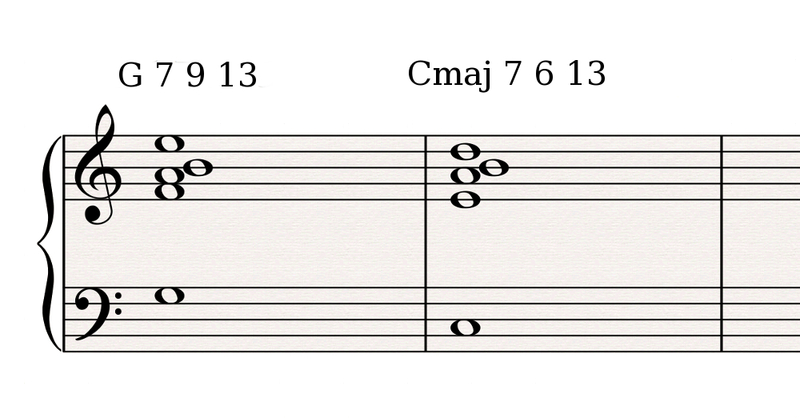 Let's begin with the half cadence chords. Let's take the example on article 39 and add the ninth to all chords, as well as the 13th of the second chord. The motion of the bass and the original top voice are the same. But there is something new going on. First of all, the fifth of the G chord disappeared to lighten up the voicing. As you saw in article 36, the fifth is the element of a chord or voicing that you can most easily do without. Then, the upper voice is now the E, which is the ninth of the D chord and the 13th of the G chord. Finally, while the middle voices remain just like in the previous example, they are now defined by F and A, whereas they are D and F in the previous example, which had no added tones. Their immobility and that of the new upper voice provide an overall stability. Let's now see how you can go back to the tonic while preserving the harmonic enrichment spirit taking this new dominant voicing as a starting point. Once again, the initial bass motion is preserved. But that's the only resemblance with the example in article 39. The most striking change is definitely the disappearance of the traditional leading-tone to tonic motion! In fact, as its name implies, the characteristic of the major seventh chord is to include the seventh of the key, the leading-tone that is. 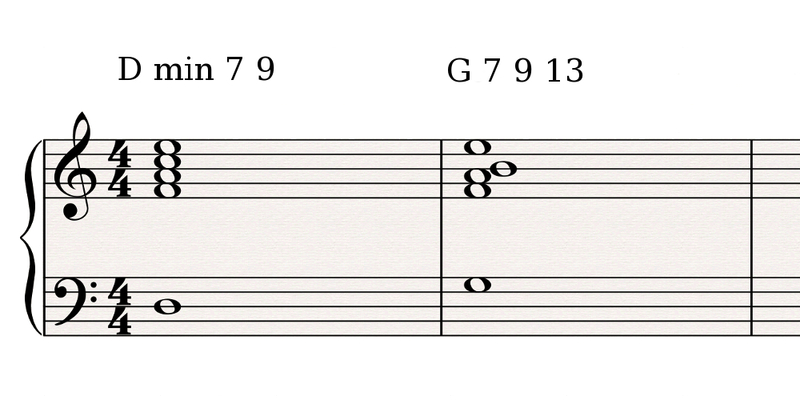 So there is no longer a resolution movement from leading-tone to tonic between the dominant and major seventh chords. The top voice is now defined by the descending E-D conjunct motion. The three middle voices remain pretty stable overall, with the A and B staying in place, while the F moves down in a conjunct motion towards E.
It's important to note that, in the two previous examples, the tones added to the voicings made us do away with anything superfluous, which meant adiós to the fifth, amigos! Now it's the turn of the plagal cadence, as seen in article 40. In this case we go from a voicing progression based on open triads to a progression of 7-9-13 versions of the same voicings. The only thing that doesn't change is the bass motion, and we also did away with the fifth to make it all more bearable. The upper voice is defined by an upward disjunct motion from G to B. For their part, the middle voices remain as stable as they possibly can, since they don't move an inch! 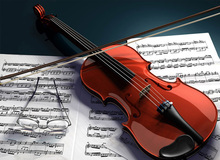 See you next time to keep exploring the use of added tones in the voicings of your cadences!